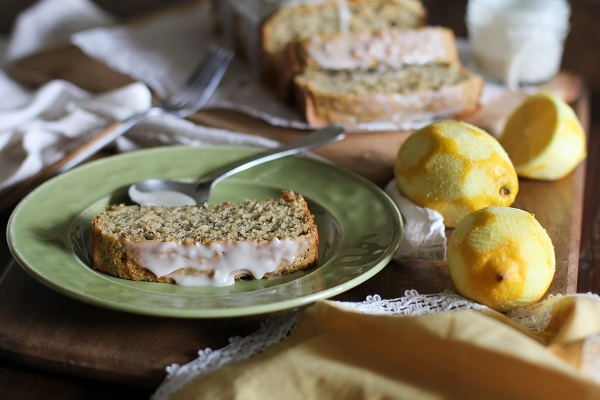 Gluten Free Lemon Poppy Seed Bread with Honey-Lemon Glaze: the bread for which you willingly walk 500 miles. If you’re going to walk 500 miles, it might as well be because of this bread. If there’s a door you want to fall down in front of, it’s this bread’s door. And if you’re going to walk 500 more miles…you get the point. I double whammied this lemon poppy seed bread pretty hard. As in I made it two days in a row. This is what you do when you’re terrified that somehow someone will rob you of your loaf. You make a backup loaf. This is what you do when you have food paranoia. Which I don’t have. Except I do. Anyway: two loaves, two days, delicious. I made the bread gluten free using oat flour and used full-fat coconut milk to make the bread ridiculously moist. By itself, the bread is a sassy hunk of sumptuous sultry lovin, but the honey-lemon glaze really brings the whole thing full circle. As in it completes you, Jerry McGuire. I made the glaze by reducing coconut milk, then adding honey and some lemon zest. Bangity boom: healthy glaze. All the other glazes are green with envy. After receiving this super awesome assortment in the mail, I used Nielsen-Massey lemon extract in this bread. As all lemon poppy seed bread should, it turned out lemon-y, heavenly, and will forever and always be swaddled in the ventricles of my heart. 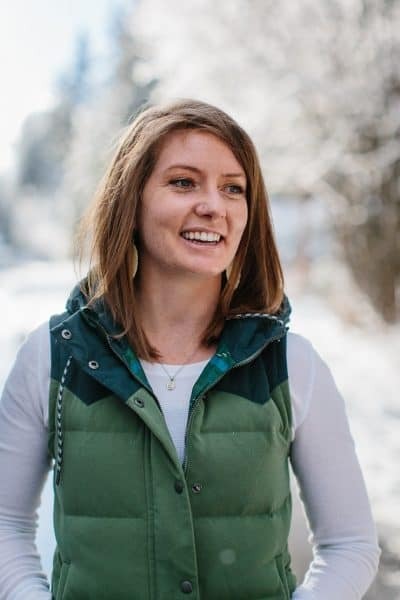 I’m beyond choosy when it comes to the extracts I use – in fact, I normally don’t use any besides pure vanilla – but all of Nielsen-Massey extracts have wriggled their way into my kitchen and have made me change my tune about baking with extracts. They’re great quality and they liven up your bakery oven! Nielsen-Massey can wriggle its way into your home, too! For a chance to win a bottle of their vanilla paste and lemon extract, simply leave a comment on this post. A winner will be selected Friday, April 4 and will be notified via email. Keep tabs on Nielsen-Massey through Facebook and Twitter. Double whammy this bread. Because someone will steal your loaf. It’s bound to happen. Preheat the oven to 350 degrees F. Lightly oil a bread loaf pan. 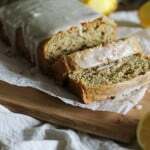 Add all of the ingredients for the lemon poppy seed bread to a blender except for the poppy seeds. Blend just until smooth and well-combined. Stir in the poppy seeds. Pour the batter into the prepared loaf pan and place on the center rack in the oven. Bake for 50 to 65 minutes, or until bread tests clean. 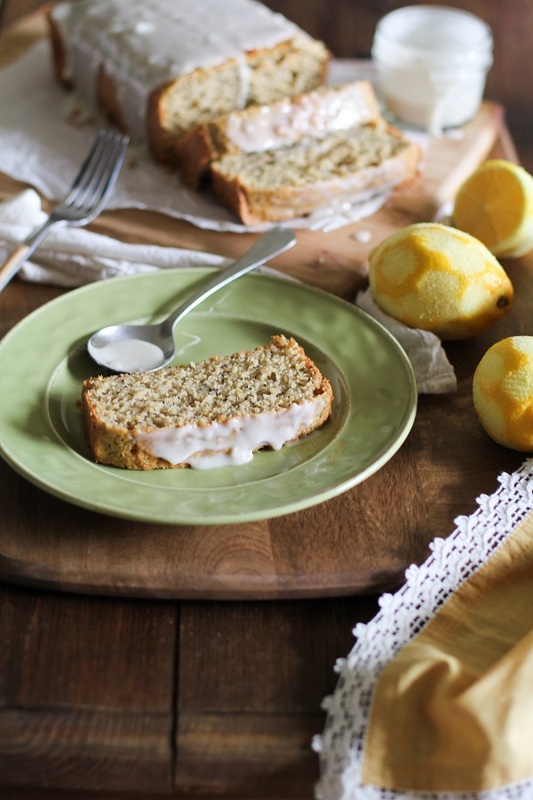 While the bread is baking, prepare the honey-lemon glaze (see instructions below). Once bread has finished baking, allow it to cool for 30 minutes before turning it out onto a cutting board. 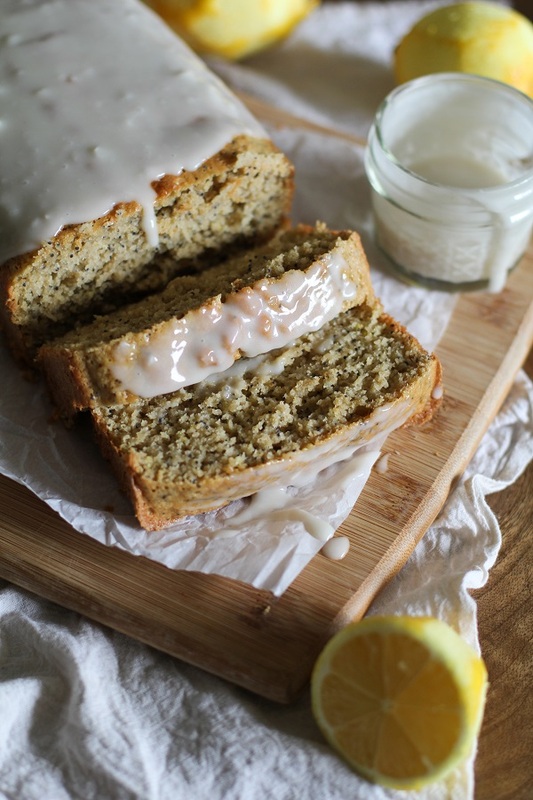 Drizzle the honey-lemon glaze on top and serve thick pieces! Add the coconut milk to a saucepan and heat to medium. Bring the coconut milk to a gentle boil and continue to allow it to boil gently (adjusting the heat as necessary), whisking frequently for about 30 minutes or until very thick and creamy. Add the honey, zest, and salt and stir well. Remove from heat and set aside. The glaze will thicken as it sits. Pour the glaze over the bread and serve in large hunks of poppy lovin. I’d love to try those products and get in the kitchen to bake with them! This seems like the perfect spring dessert! Will putting GF oats in the Vitamix / blender give me a fine enough texture for oat flour? Hi Monica, that’s a great question. 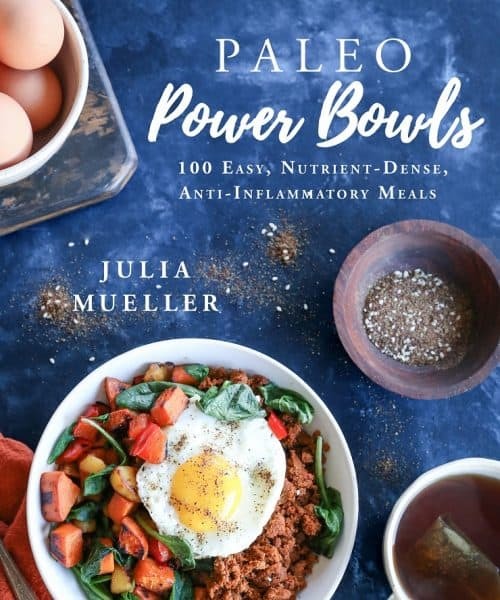 While I’ve never tried this myself, my assumption is that it should work as long as you’re able to get a similar consistency to store-bought oat flour, which is what I used. If you aren’t able to get the flour to be super fine, I’d still give it a shot. Let me know how it works out! I made this and used my vitamix to make the flour. The vitamix or blend tech can blend it just as fine as flour! I didn’t know healthy glaze existed! Yes, this bread is totally going to give my life new meaning 😀 Thanks so much for sharing! You got it, Kate! Yup, reducing coconut milk and adding natural sweeteners and flavors results in the most insane-o glazes EVER! I discovered this trick over the holidays and have been going glaze crazy ever since! 🙂 Have a great weekend, my dear! A backup loaf is totally a thing, and I would most definitely do it with this bread. SO YUM, m’lady! What a lovely, pretty bread! I am sucker for anything with lemon! Holy MOLY this looks freaking dreamy mcdreamy pants. I need this sassy hunk of sumptuous sultry lovin immediately , topped with copious amounts of that romantic glaze. I just bought poppy seeds so helloooo this is fate! This looks amazing, I would definitely walk for this loaf. LOVE all things Nielsen-Massey! The bread sounds delish with the exception of the eggs. Being vegan I don’t do eggs, I’ll try the recipe using ground flax seed and water as egg replacers and up the baking powder a bit. Amazing how well that works! This is my type of bread. You need to figure out what to do with their chocolate extract that I received, due to you-know-who and their aversion to chocolate. So far, I just look at it and wonder. Meanwhile, I’m on my way for a piece of bread, k? I’m going to make this for my next baby shower. Loaves with glazes are usually a hit and this one is so much more healthy than the standard sugar laden ones. PS. I wonder if it can be frozen? Perfection. Perfection, I say! I’ll eat both loaves now, mmkay? Friday deserves 2 loaves of bread 🙂 I love it. This bread looks divine! Lemon and coconut (and of course chocolate!) are my all time favorites! I bet adding the lemon extract to my lemon bars would give it more pucker power too! Time to make bread!! Sounds fantastic my dear. We just came in from a rainy and gross day and all I can think about is something tasty like this. I’m a sucker for lemon poppy seed anything. I’d walk any where for this bread; especially because it’s glazed, I’m a sucker for glaze! I am loving lemon and vanilla right now! I would love to try the extracts and this is on my to make list now!! I totally have bread paranoia mostly because I live with a boy WHO WILL EAT A WHOLE LOAF IN ONE SITTING. Is it paranoia if it’s actually a warranted fear? Hmm. Oh lemon poppy seed how I love thee! Looks delish!!. Will try it this week. Thanks. 1,000 miles total–done. Now, hand over the loaf 🙂 This loaf of bread really is gorgeous. Pinned. Sounds wonderful. I look forward to trying it! I love Nielsen-Massey as well! I’m already drooling over this… It’s the glaze, the GLAZE! I haven’t made a glaze in ages and this is calling my name. mmm. Thank you SO so much! Bread robbing is definitely shameful. Especially lemon poppyseed!! I am in love with this recipe. Anything with bread + lemon + poppy seed has my name all over it. i love that its gluten free. I will be making this for Easter. love it. Looks Delish! Definitely being added to my list..
Yaaay, glad to hear it, Julia! Let me know how you like it! Brilliant cake recipe. I must try this as I love coconut milk too. This looks lovely! 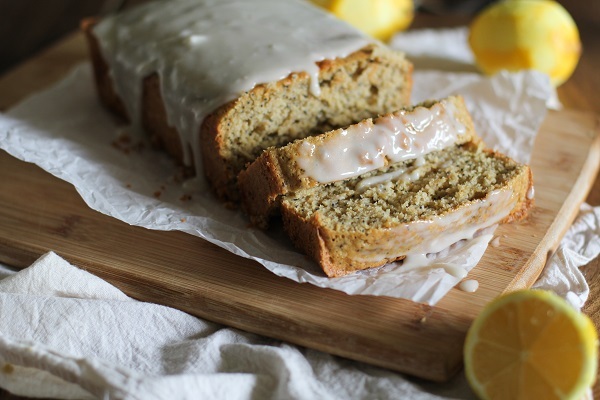 That honey lemon glaze sounds delicious… Yum. I love Nielsen Massey products too, I will never go back to using the cheap supermarket fake stuff again! looks great, going to try it this weekend!